The Alternate Nation of Abanindranath Tagore provides a revisionary critique of the art of Abanindranath Tagore, the founder of a 'national' school of Indian painting, popularly known as the Bengal School of Art. It categorically argues that the art of Abanindranath, which developed as part of what has been called the Bengal Renaissance in the 19th-20th centuries, was not merely a normalization of nationalist or orientalist principles, but was a hermeneutic negotiation between modernity and community, geared toward the fashioning of an alternate nation, resistant to the stereotyping identity formation of the nation-state. It also establishes that his art-embedded in communitarian practices like kirtan, alpona, pet-naming, syncretism and storytelling through oral allegories-sought a dialogic social identity within the inter-subjective contexts of locality, regionality, nationality and trans-nationality. 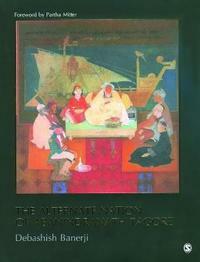 This book is well-illustrated with many of Abanindranath's creations. It will be a rich reference work for students, researchers and academics from various subject areas such as arts and humanities, sociology and cultural studies, and would be precious for artists, art collectors, connoisseurs, museums and art galleries. Debashish Banerji is a great-grandson of Abanindranath Tagore and holds a Ph.D in Art History from the University of California, Los Angeles. He is a professor of Indian Studies and the Educational Co-ordinator of the University of Philosophical Research, Los Angeles. He also serves as an Adjunct Professor of Art History at the Pasadena City College and at the department of Asian and Comparative Studies at the California Institute of Integral Studies, San Francisco. He has curated a number of exhibitions including, "Divine Carriers: Recent Art from India and Nepal," at the Laband Art Gallery, Loyola Marymount University, Los Angeles, CA (1998); "Contours of Modernity: Contemporary Art of India," at the Founder's Hall, SOKA University, California (2005); "Yamato-e: The Journey of Japanese Painting," at the Kala Kendra, Auroville (2006) and "The World of Ajanta," at the Sri Aurobindo Ashram Art Gallery, Puducherry (2008).